The Guardian – Does microfinance work? – Joyful Development Inc. 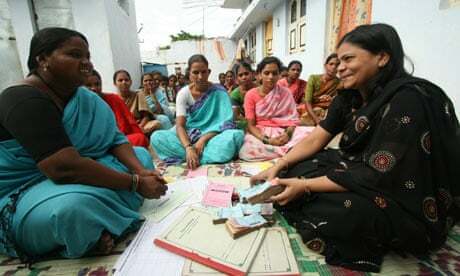 The Guardian – Does microfinance work? Much of the evidence strongly supports microfinance, but there is room for interpretation, says CGap’s Tilman Ehrbeck. Does microfinance work? This question has been intensively researched and hotly debated in the development community over the past few years. The answer depends on what you mean by the words ‘microfinance’ and ‘works’. I’ll explain more, but in a nutshell, if your answer is probably not, you’re likely using a narrow definition of microfinance and a specific notion of what’s meant by ‘works’. Getting to yes involves a broader definition of microfinance and a more holistic interpretation of what constitutes success, and you need to draw on several strands of research. Here is the narrow, probably not story. In the early days of microcredit, the idea that small amounts of short-term working capital would help poor people engage in high-yielding, productive activities that allow them to pay back their loans and grow their way out of poverty was heralded by some as a silver bullet. Muhammad Yunus spoke famously of putting poverty in a museum. So, some research has taken this rhetoric at face value to see whether microcredit (narrow definition of microfinance) could directly and demonstrably reduce poverty (specific notion of ‘works’). Researching this issue is actually not easy to do. The increasingly dominant school of researchers argues that you can’t tell the impact of any intervention if you don’t check against what would have happened anyhow. To come up with this so-called counterfactual, what you need to do is to borrow from the medical field and apply randomised-controlled trials (RCTs), where one group of people is subject to a specific intervention, and an otherwise identical group is not. Another school of researchers thinks that in real life you can’t prevent pollution of a control group over meaningful time horizons and would prefer statistical controls in larger-scale econometric studies or other qualitative methods. The first crop of RCTs on microcredit found that it helped on the business side of things, but didn’t translate into direct poverty reduction as defined for the purposes and the time horizons of the studies, which itself is a tricky task. What measurable variables defining poverty could plausibly show meaningful change over the typically short time-horizons over which RCTs are conducted? Abhijit Banerjee and Esther Duflo’s widely-cited 2009 study of microcredit clients in Hyderabad measured a number of variables and did not detect impact on the health and education expenditures viewed as poverty proxies relative to the control group. A comprehensive review of the earlier, more traditional econometric work on direct poverty reduction impacts of microcredit found no robust evidence. Given the mutual criticisms among the methodological camps, the intellectually honest answer to the narrow question of whether microcredit can demonstrably reduce poverty might be we don’t know, but I would tend to share the general scepticism that any single, indirect intervention can be found to reduce a multifaceted, deep-rooted, and persistent problem such as poverty. The broader microfinance works story starts with the empirical observation that poor families typically live and fend for themselves in the informal economy – not by choice, but by necessity. In economic terms, they are consumers and producers. As such, they need – and we know they use – the broad range of financial services: savings, credit, insurance, payments to generate incomes, build assets, smooth consumption, and manage risks. In this context, we might apply a broader definition of microfinance as providing poor households excluded from existing systems with formal financial services that are better than age-old informal alternatives. Whether providing that access works can be assessed at several levels: Does formal financial access and usage help households improve their lives? Does it help local economic activity? What are the impacts at a macroeconomic level? Against these criteria, the evidence that is accumulating is actually quite strong. At the local economy level of impact, Robin Burgess and Rohini Pande of Harvard University studied one of the largest natural experiments that happened to occur when India forced banks from 1977 to 1990 to open branches in rural areas. Economic activity in those areas where branches were opened increased, and the researchers attribute approximately 60 percent of total poverty reduction to that expansion over the baseline during the period. Finally, at the macroeconomic level of impact, there is a quite well-established body of literature showing that the depth of financial intermediation is positively related to economic growth and negatively related to inequality as measured by the Gini coefficient under most circumstances. Whether the development of inclusive financial systems that help the poor is worthy of scarce, subsidised development funds is a separate question. An increasing number of policymakers in the developing world and emerging markets in the global south seem to think so. They are acting on their conviction that financial inclusion is an important ingredient for economic and social progress at home. More than 35 countries representing 1.7 billion people have made public commitments to financial inclusion and developed national approaches to accelerate financial access for the poor while ensuring stability for the broader system and the protection of vulnerable consumers. The narrow impact debate seems to be something of a northern phenomenon. Tilman Ehrbeck is the chief executive officer of CGap, the Consultative Group to Assist the Poor.